As one of the pieces of literature in the existential canon, "Waiting for Godot" is not going to beg you to read it, and if anyone tries to force you, it just won't work. You have to want to know, as you have to want to watch the play. I've seen both terrible and not terrible performances, but never a good one. I once tried to talk a friend into going to see it with me and he said, "Is it exciting?" and I said, "No. But it's amazing. "And that's how I feel about the play. But even moreso, that's how I feel about the book. When you read it, you are part of the mystery. It is a book with magic in it that makes you take part. Why, exactly, are you reading it? Why read about two men trying to figure out what they are doing, distracting themselves and wallowing in their own misery or hilarity all the while? Why, indeed. 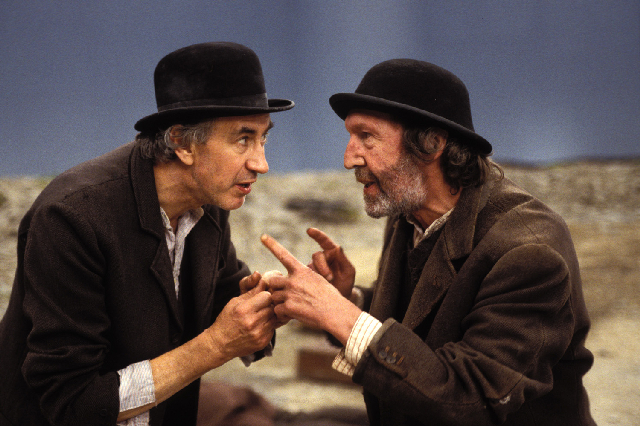 The basic storyline of the play is simple: two men are waiting for "Godot." Act I is the two of them picking at each other, being bored, threatening to leave each other, and so on and so forth. They spout some of the most double-edged and hilarious and tragic lines you will ever read. At the end ot the act, they haven't left the spot they started in, and no Godot. Act II is much of the same, but another man enters, driving still a fourth man like a packhorse. The driver acts as if gloriously wealthy and the other as if his slave, almost an animal. Yet their relationship is far more complex than that, and they mystify the main characters to no end. What they also do is distract them from waiting for Godot. Does he show by the end of the play? That is for you to read and find out. But the true beauty of the play is not in the beginning or in the ending, it is in the waiting. Reading what these two do while they are waiting makes us question what we are doing with our lives, if there is a point of living at all, and if we will ever be able to find it, or if we will be alert enough to know it when it taps us on the shoulder. I have heard it speculated that Godot is a word for god, and that this play is about how we while away our time waiting for god. I have heard it said that it is, in fact, pure nonsense, and that the attempt to read anything into it says a lot more about the person doing the reading than the play itself or the writer, Beckett. Read, and enjoy the mystery for yourself.